Whether it’s dice, slots, roulette or poker, everyone is hoping they can find a way to put the odds in their favor in the gaming room. A simple Google search will bring you all kinds of advice from how to throw the dice in craps to how to distract a dealer at a blackjack table. Most of those tips being proffered are pretty harmless to the casinos, usually giving people a false hope that they’ve found an edge. On the other hand, because of the stakes, there are many others who push boundaries and actively work up new ways to cheat and, if able to not get caught, to win. It is gamers of this latter type, the cheats, that surveillance teams are on the lookout for, because they can be a threat. The focus in this article will be on card games. Cheating at poker and blackjack comes in a wide variety of styles. Card mechanics are those who use sleight of hand and manipulation. There are muckers who switch cards or conceal cards. A majority of cheats, perhaps as much as 75%, do so by means of placing large nearly invisible marks on the cards. This will be explained shortly. 15% of cheating involves sophisticated marking that requires optical devices. Finally, and this is what has alarmed today’s casinos, there are new, futuristic high-tech sensing devices and poker analyzers which if unchecked will continue to become more of a problem. Catching cheaters who use high-tech methods has increasingly become a challenge to surveillance. The old ways of gaining an advantage at cards are slowly being replaced by cheaters using sophisticated optical devices such as contact lenses, eyeglasses, modified cameras, and poker analyzers. These optical readers are used to detect invisible inks, analyze poker hands and see near-infrared marks on cards. Today’s surveillance expert is faced with the daunting task of trying to keep ahead of all of this technology. When it comes to watching what goes on at a card game surveillance is no longer just about keeping a close eye out to catch players or dealers with card mechanic skills who are capable of performing special moves to control, switch or mark cards. Surveillance detectives must also learn to count cards. When catching a card counter the best defense is a good offense. Complex computer programs have been designed today to track cards, chips and players, count cards, look for and single out suspect games etc. This is an important first step to catching high-tech cheating. Investigators must develop a sixth sense that gives them the uncanny ability to recognize a cheater’s social habits, body language and manifold diversions. To top it all off they must be well-informed on all of the proper table procedures. The list of required skills goes on and on. It takes genuine devotion and years of study for a surveillance detective to develop these skills. He/she must become a highly trained specialist. Modern day high-tech cheaters are often the first to apply new discoveries to the gaming tables to gain an unfair advantage. As a result, technology has created a niche for a new breed of specialized surveillance expert. High-tech cheaters no longer need to develop the skills of a card mechanic, count cards or do business with an “inside” employee of the casino to gain an advantage over the casino. The years of practice that it takes a card mechanic to master such skills as false shuffling, false dealing, switching cards (mucking) and developing teams to create diversions while a deck or shoe is being switched is no longer necessary. The fact is that technology has made it possible for anyone to become an instant cardsharp. The big question for surveillance professionals is “will you be ready?” Let’s take a look to see what can be done to help you to detect, prevent and defend your casino from becoming a target of high-tech cheaters. The first step is to become aware of what high-tech threats are out there; that is the goal of this article Next, you will want to know what can be done to protect and prevent these systems from working in your casino. Finally, you will need the proper training and equipment to detect these high-tech scams and catch the “would be” thieves before they ever leave the tables. To get started it will help to narrow things down. Let’s begin by taking a look at some of the older high-tech systems that have been used in the past. 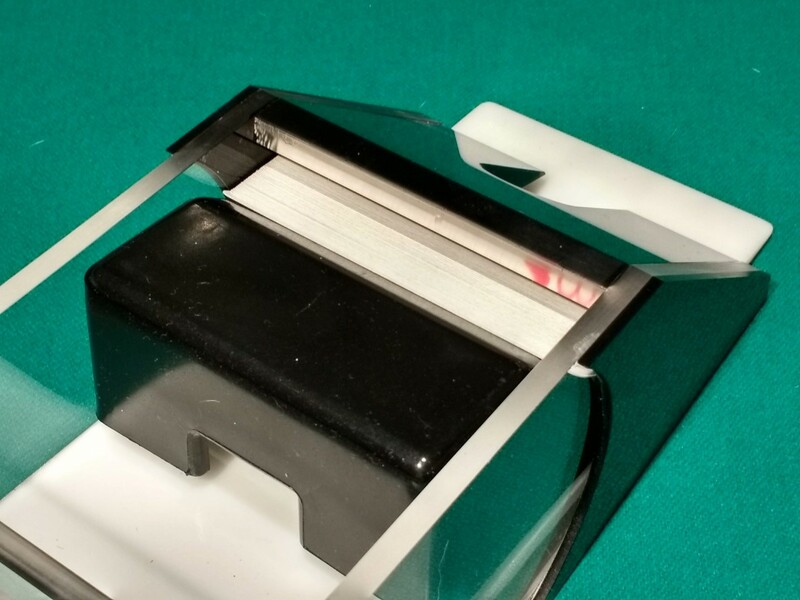 About 50 years ago an ingenious prism device was developed by a gentleman in Nevada that allowed the dealer to peek at the top card in a shoe and hold it back until a favorable time. This device could be attached onto the back of a dealing shoe. The dealer could simply pull the top card back into the prism to peek at the value of the card. This eliminated the need for placing a mark on a card. The top card could be held back (second dealing) until it was needed. This system is what I have termed a “no mark-mark.” This means no marked card was required in order to know the top card. When a dealer is in league with a player the proper term is called “social engineering.” Many subtle methods of using this system were developed. Perhaps the most devious method was for the dealer to simply signal a player when to hit or stand. This eliminated any need for the dealer to hold the top card back for second dealing. An interesting offspring of this invention is an adaptation of this idea to the gaming table enabling a dealer to check the face down card to see if it is a face card or an ace. If the original developer had only taken his idea to another legitimate-level he would have made a fortune. Shaded cards are marked by applying “daub” or a shading ink to a pre-determined area of the playing card. This can be done with a Q-tip, brush or during play by placing “daub” on a finger-tip and touching the card to mark it. “Juice” decks are an advanced form of “shade.” This special type of mark requires considerable training to see. It is a much more sophisticated type of mark, yet still visible to the naked eye. “Flash” cards are made before the cards are put on the table. The cheater trains his/her eyes to detect a light area of the cards. The mark is usually a round dot or a line. Each of the above types of marks require specialized training to see. The advantage to these types of marking systems is that the cards can be identified from a long distance. This means that the cheater can know every player’s cards simply by glancing across the table. Many measures must be taken into consideration to detect or use these types of marking systems. Knowing what game is being played, the type of lighting over the table and how to focus your eyes to read the marks are just a few factors. These types of marking systems are still being widely used in casinos today. Learning to read these types of marks is a must for surveillance. Surveillance experts need to be taught how to read these types of marks so they can catch the scam before the cheaters leave the table. Over the past decade a great many high-tech invisible inks have been developed that can only be seen while wearing custom eyeglasses, contact lenses or by using special modified cameras. Most of these systems use special colored lenses or filters. It has been estimated that over 90,000 decks of high-tech marked cards have been produced over the past decade. Three of the main sources where these cards originate are from such countries as China, Korea and Romania, made available through various online sites. A cheater can even send casino decks to these companies to have them marked. These companies also offer contact lenses, eyeglasses and cameras that are designed to read the marks. Normally the suspect cards would need to be sent off to a specialized lab for forensic examination. By then the cheaters have left with their winnings. It then becomes problematic trying to make a case to recover any losses. Some invisible inks cannot be found simply by looking through a red filter or a UV light. This presents a new challenge for surveillance. The only way to detect this type of scam is to have the correct type of optical equipment needed to see the marks. 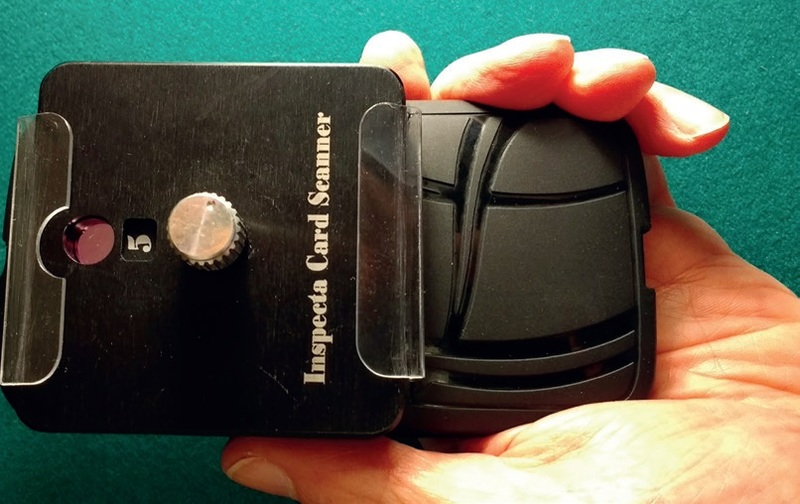 Nowadays, surveillance experts can locate most of the high-tech marking systems in seconds by using a specialized device known as an Inspecta Card Scanner. This piece of equipment can be held to the eye for instantly identifying high-tech marks. 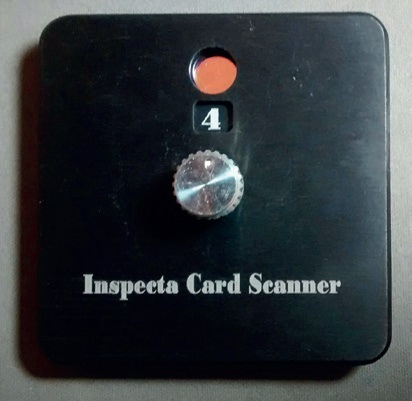 One of the best features is that the Inspecta Card Scanner can be attached to a cell phone to covertly walk around the casino and take live video of cards on all of the tables. It is then simply a matter of playing back the video to see if any of the cards are marked. Scanning for marked cards while they are on the tables will not only locate the marks but also record the players who are seated at the table. What better way of collecting evidence? In his book The Unexpected Gambler, Robert Asiel writes about how the casinos themselves used to cheat and even gave bonuses to blackjack dealers who took the gamblers’ money. Asiel decided to turn the tables and spent a lifetime as a crossroader, one who works in collusion with others to cheat the casinos. He justified his behavior by calling it a form of revenge. But things have changed a lot since those earlier days. Today the casinos rake in money honestly, as the odds favor the house. It is more important to maintain a good reputation, and employees who cheat are fired, not rewarded. All over the world the casino industry provides jobs for tax-paying citizens, therefore they have a vested interest in playing fair. Nevertheless, there are plenty of scammers driven by greed or a need to see how much they can get away with. For this reason, casinos must spend a boatload of money on surveillance and training in order to keep things on the up and up for everyone. Cheating is essentially stealing. Surveillance experts need to be taught how to spot shade, juice and flash. These marks are in the visible range and do not require special optical readers to detect the marks other than the human eye and the proper training. From there, the next step is to be trained and equipped to use the specialized tools needed to locate high-tech marks outside the range of the human eye, that do require special filters for the eye to see. Some of what we’re finding today is nothing short of sci-fi. 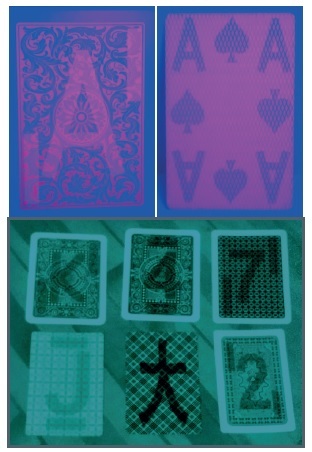 For example, there are decks with barscodes written on the edges of the cards that can be read with a modified near-infrared camera. The IR read then sends an image of bar codes to an analyzer in the player’s pocket that determines which player has the winning hand. The analyzer then converts the signal to an audio message which is sent to a receiver in the player’s ear. Not possible, you say? Think about this. Self-driving cars use sensors that feed information to a brain box that must calculate 2 million bits of data per second. Reading cards and calculating who was dealt the strongest hand is relatively easy by comparison. Sending a signal to a player by means of an ear piece is a piece of cake after that. Microchips, photon beams and RFID sensors within the cards themselves, are no longer future tech. Even the ability to see through cards is already here. Old school cheats will be easier to catch, but casinos need to be prepared for these emerging technologies. This is a growing need and it’s real, which we hope to address in our next article. 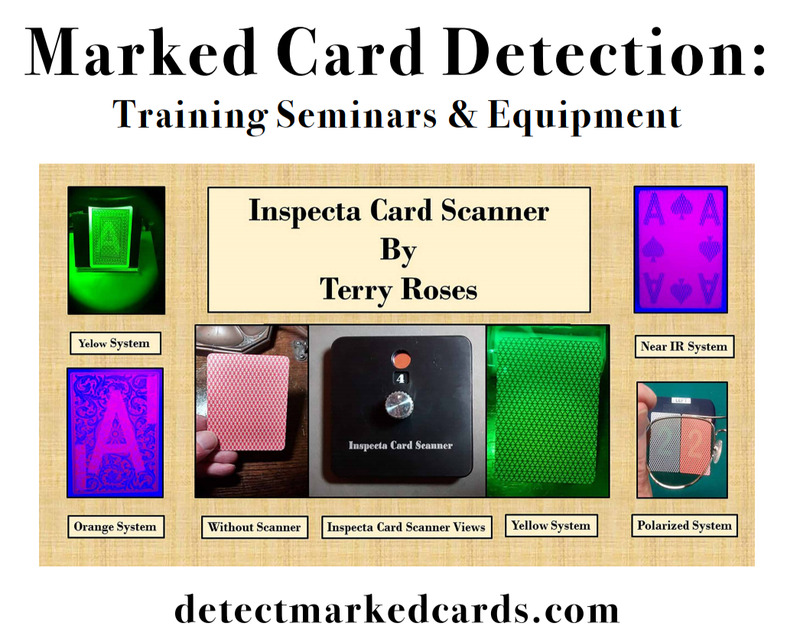 Terry Roses is the “go to” person whom many of the world’s leading casinos have reached out to for defense training against high-tech card marking systems. 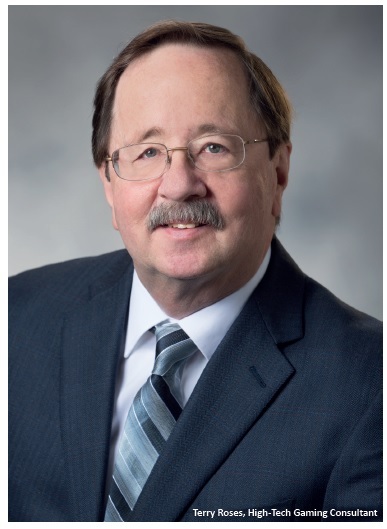 His expertise on how cheaters cheat has made him a much sought-after speaker and instructor at conferences like the World Game Protection Conference (WGPC) as well as The Upper Midwest Intelligence Gathering (UMIC). His Inspecta Card Scanner has been endorsed by leading game protection experts including Ted Whiting, VP of Corp Surveillance at MGM Resorts International.